To get this new feature, WhatsApp users need to update their app to version (2.18.207). Those who haven’t got the feature are advised to wait till they get an update notification. 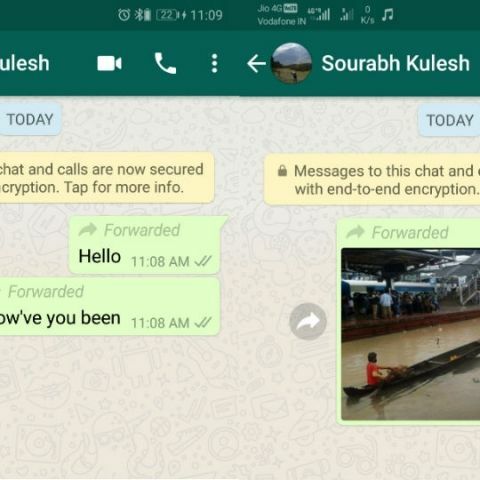 WhatsApp has rolled out a new ‘Forwards Label’ feature which the platform has been testing to curb the dissemination of spam and fake news on the platform. WhatsApp will now indicate that a message is a forward and not an original message typed by a contact by displaying a “forwarded” tag on the top of that message. The feature works for texts as well as multimedia messages. There is no option to remove the tag. To get this new feature, users need to update their app to version (2.18.207). Since it is a phased roll out, those who have not received the update are advised to wait for some time till they get an update notification. The company claims that this extra context will help make one-on-one and group chats easier to follow, and also help users determine whether their contact person has written the message he/she has sent or it originally came from someone else. WhatsApp first reported to incorporate this feature in its beta version 2.18.179 to identify spam from a normal message. WhatsApp already uses several features to maintain user privacy and security. Users can report spam or block a contact in one tap and can always reach WhatsApp directly for help. The Facebook-owned instant messaging app has also been testing a string of new features lately. It recently re-introduced an improved Media Visibility feature in the beta version 2.18.194 empowering users to manually enable or disable media visibility setting for specific chat(s) and group(s). The company is also testing a Suspicious Link Detection feature that will help users detect sent and received suspicious links in WhatsApp. Not to forget the group video and voice calling feature that is expected to be rolled out soon, and a group setting for admins that enables only them to send messages to a group. WhatsApp now has 1.5 billion monthly active users (MAU) who are exchanging nearly 60 billion messages in a single day. It has over 200 million monthly active users in India.